Since the 26 October 2010, Mme Irina Bokova, UNESCO Director-General announced that the 12 SAF Institutions of Excellence will be able to use UNESCO logo and named UNESCO Madanjeet Singh Institutions of Excellence. Applications for the SAF Madanjeet Singh group scholarship at ACJ should go through the secretary of the board of your respective country and get the approval of the Chairperson. 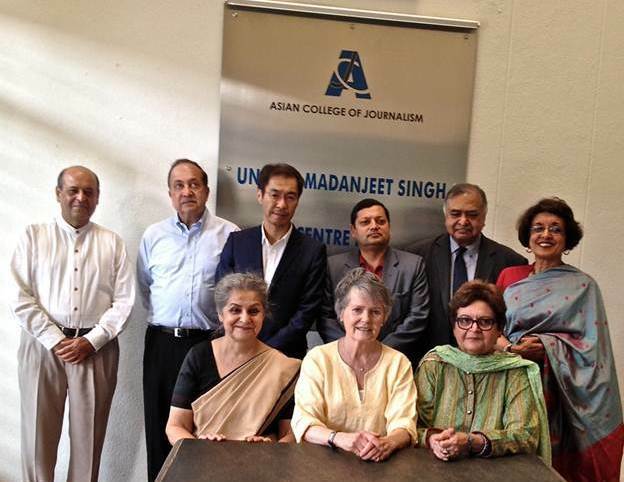 In an innovative move designed to promote regional cooperation, the South Asia Foundation (SAF) has instituted 8 full scholarships for young people (women and men) from the eight SAARC countries to study at the UNESCO Madanjeet Singh Centre of South Asian Journalism (UMCSAJ), Chennai. The scholarships will cover the tuition, living and travel costs of the selected students for the duration of the ACJ's ten-month post-graduate diploma course in journalism. Students from Afghanistan started benefiting from the scholarships in 2003, Bangladesh in 2002, Bhutan in 2002, India in 2002, Maldives in 2002, Nepal in 2002, Pakistan in 2004 and Sri Lanka in 2002. The ACJ awards for investigative journalism 2017 and Convocation of the class of 2017-18.